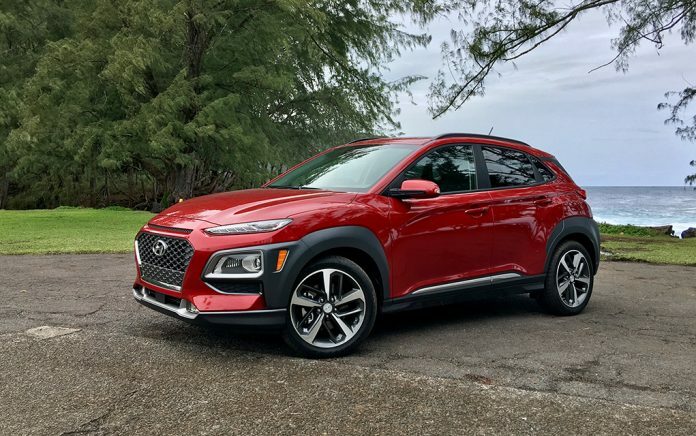 The new Hyundai Kona, a subcompact crossover that was introduced in 2018 with an aggressive design and sporty performance, adds an electric model for 2019. The base Kona SE and SEL models are powered by a 2.0-liter four-cylinder 147 horsepower naturally aspirated engine that’s paired with a six-speed automatic transmission. The Kona Limited and Ultimate versions are powered by a sportier 175 horsepower turbocharged 1.6L four-cylinder engine and a seven-speed dual-clutch automatic transmission. The starting price for the base 2018 SE model Kona with front-wheel drive starts at $19,900 and $20,800 for all-wheel. The Kona Limited starts around $24,700 for front-drive and $26,000 for all-wheel drive. I tested a thunder gray all-wheel drive 2018 Hyundai Kona Ultimate. For a MSRP of $28,700 it came well equipped with standard features, including perforated leather 8-way power seats with lumbar support; blind spot monitoring; lane keeping assist and attention warning; forward collision alert and emergency braking; power sunroof; Apple CarPlay and Android Auto; voice recognition; touch screen display; wireless device charging; and heads-up display. The only option was carpeted floor mats for $125, which brought the sticker price to $29,805. The Kona Ultimate gets a combined 27 mpg with 26 city and 29 highway mpg. However, the Kelly Blue Book ranks the Kona in 8th place among the “most fuel efficient crossovers for 2018. KBB gave it a combined rating of 30 mpg. For 2019 model year, Hyundai introduced a Kona EV with an electric range that’s puts many EV rivals to shame. Starting at $37,495 with a $7,500 tax credit, the battery-electric crossover has an estimated range of 258 miles on a full charge. The 2019 Kona EV is powered by a 64-kWh lithium-ion battery with a single electric motor that produces 201 horsepower.